We proudly distribute our award winning beers to bars and restaurants in Maryland and Washington DC. We currently offer both 1/2 barrel and 1/6 barrel kegs of our year round and seasonal brews. Q: Do you guys require a keg deposit? Q: Will you clean our tap lines? 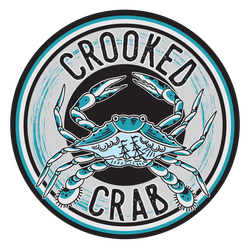 A: We are happy to clean any tap lines that are dedicated to Crooked Crab beer on an ongoing basis. Q: Who distributes your beer? A: We do! Whenever you receive a keg from us, you know it was handled properly from brewery to bar because it was only touched by our brewery staff. Q: What are your delivery days? A: We deliver to Anne Arundel on Wednesdays. We deliver to Montgomery County, Howard County, Carroll County, and Baltimore County on Thursdays. We deliver to Washington DC on Fridays. If you do not see your area above, drop us a line and we can hash out logistics. Q: Do you have awesome tap handles? A: We have very awesome tap handles which we can provide on request. Copyright © 2018 Crooked Crab Brewing Company, Inc.